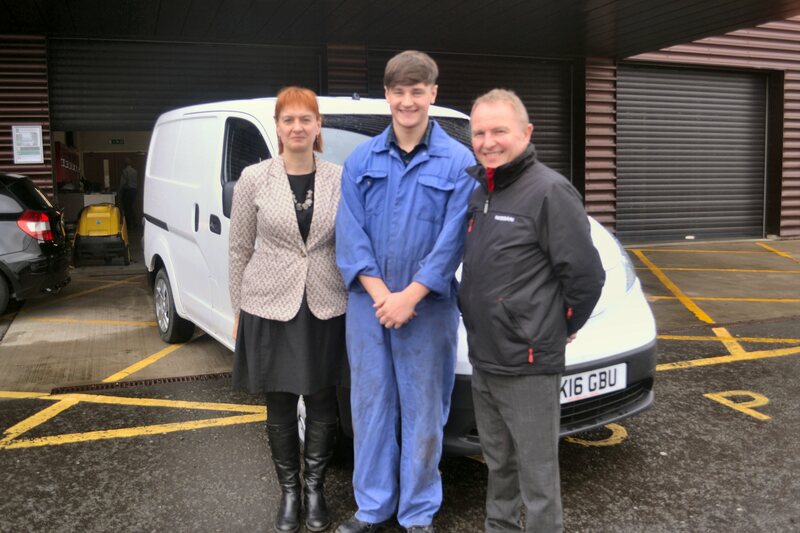 JOSHUA Middleton (18) – a student at Edinburgh College – is steering his automotive engineering career in a new direction after being awarded the Edinburgh College Development Trust’s electric vehicle (EV) scholarship, funded by long-established Midlothian-based Nissan dealer, Alex F Noble & Son. Joshua has been selected to complete a scholarship designed to ensure he will leave college equipped with a greater depth of knowledge in EV technology, allowing him to become an accomplished automotive professional who can support the motor industry with future sustainable transportation developments. Joshua is currently studying towards his IMI Level 1 Transport Maintenance (Light Vehicle) certificate at the College’s Midlothian Campus and felt that applying for the EV scholarship would support his goal of building a lifelong career in the automotive industry. The EV scholarship is managed by the Edinburgh College Development Trust – the independent charity which supports students at the College – and is funded by Alex F Noble & Son. Joshua is the third student to have been selected to complete the programme having shown a real interest in EV technology during the application process. He will spend one day per week working alongside Stephen Parry-Jones – the College’s EV administrator. Edinburgh College Engineering curriculum manager Ross Milligan said: “The growth in electric vehicles across the UK is so much, that soon there will be a much-increased demand for garages to have workers skilled in EV maintenance and repair. This scholarship gives Joshua a brilliant chance to get ahead of the game and get some valuable training and insight under his belt.